Now, an unorthodox kind of church for Orthodox soldiers. The Russian military unveiled an unlikely new weapon in its arsenal this month — an army of parachuting priests. The unit of chaplains, who have joined the Russian Airborne Force to train in parachute jumping and vehicle assembly, will operate out of flatpack churches that can be airlifted in to wherever soldiers may be stationed. The church could be mistaken for a standard-issue army cabin, taking the form of a khaki-colored shed on wheels, were it not for the cladding of gilded icons and the majestic onion dome spire sprouting from its rooftop. The mobile prayer room has also been fitted with a “life-sustaining module”, which includes a diesel power source, an air-conditioning unit and a fridge, reported Russia Today. The chapel is flown in as a kit of parts, delivered via the kind of airborne platform usually used to carry armored vehicles and other heavy military equipment, and is then assembled on the ground. Within, the gilded interior incorporates crucifixes, bells and icons, as well as a mini theatre — which can be extended sideways with additional wings, thus forming the cross-shaped plan of an Orthodox church. The initiative has not gone without controversy in the Russian government, where debate rages over the cost of rearmament and rising military spending. While the Russian army insists this is the first ever flying chapel in the world, Orthodox Christianity is not the first to bring mobile worship to the battlefield. The Israeli Defense Force launched a mobile synagogue initiative in 2011 to allow troops to pray more comfortably as they operate the Iron Dome anti-missile system in southern Israel. The UK Friends of the Association for the Wellbeing of Israel’s Soldiers (UKAWIS) has provided such mobile synagogues — which contain an ark, reader’s platform and washbasin — as “a source of spiritual sustenance [for the soldiers] as they carry the weight of Israel’s security on their shoulders”. Since the 1950’s, St. Sava’s has offered its youngsters catechetical courses and cultural classes — held every Saturday — that instruct and reinforce the church’s religious teachings and cultural heritage. Currently, the community center has barely enough space to accommodate the nearly 130 children, between the ages of 7 and 17, who attend the classes. The curriculum includes seven grade levels with courses in religion, the Serbian language, traditional dance and singing. For this and more, read Germany’s Orthodox Serbs, from the July 2009 issue of ONE. 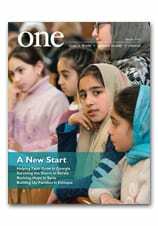 In the September 2012 issue of ONE, Lviv-based journalist Mariya Tytarenko wrote about an Armenian Apostolic congregation's efforts to rebuild church and community. Presented below are some of the thoughts and impressions she recorded on site. After the Divine Liturgy in the Armenian Apostolic Cathedral of the Assumption of Mary in Lviv, I was invited to join the choir in the church sacristy for a special event. I was curious. When it’s cold in the church, Father Thaddeos Gevorgian, whom everybody calls in Armenian ter hair, conducts a homily after the Divine Liturgy in the much warmer sacristy. Since there had been a homily during the Divine Liturgy, I assumed this would be something else. I followed the choristers, who had accepted me into their little “family” the first time we met, last Sunday. That was 26 February — Mardi Gras, or Bun Barekendan in Armenian, which marks the beginning of the Lenten fast. Romana Melnyk was carrying a hyacinth in a flowerpot. “It’s Yulia Tsviakh’s 23rd birthday today, and this is her favorite flower,” she whispered as we entered the sacristy. Romana, 35 years old, is Ukrainian, but her husband is Armenian. Her parents still have not accepted her husband, whom she married against their wishes. “I’m very stubborn,” she had remarked on the circumstances of her marriage, as well as her first impression of the church choir in May 2001: “I was born to sing here!” Since then, she has been a soloist in the choir. Archbishop Grigoris Bouniatian, the Primate of the Armenian Apostolic Eparchy of Lviv, is inside the sacristy speaking with Karlo Sargsian, the president of the Armenian community in Lviv. We all stood around a large table, and everyone greeted each other in turn in three languages: Ukrainian, Russian and Armenian, along with translations from Armenian into Ukrainian, since many of us, including Yulia, didn’t know any Armenian. There are only five Armenians in the 12-person choir. Yulia looked very happy, especially after Archbishop Grigoris and Father Thaddeos had given her their blessings. She treated everyone to cake and drinks — juice, in observance with the Lenten fast. “I’m Armenian; that’s why I’ve never raised a toast drinking juice in place of cognac,” Karlo joked, raising a toast to Youlia’s health. “It’s because Solomiya is pregnant,” 25-year-old Marichka Dolna interrupted. “I get cold really quickly, whether I’m singing in the choir or playing the organ.” Marichka said she plays organ for the church every Saturday from 3:30 to 5 PM. The patriarch, who was one of the seven serving presidents of the World Council of Churches is said to have been taken ill a few weeks ago, but the cause of his death, is yet to be established. Born in Adwa in Tigray Province of the northern part of the country, the patriarch did his education at the Theological College of the Holy Trinity in Addis Ababa under the patronage of Patriarch Abune Tewophilos. Our thoughts this day are with the people of Ethiopia, and we join them in praying for the soul of their patriarch. When Kosovo unilaterally seceded from Serbia, one question on many minds was what to do with the dozen or so Serbian Orthodox monasteries scattered across the country. In contrast to the mass exodus of Serbs from Kosovo over the past decade, the monasteries are very actively consolidating their presence. For religious Serbs, they are among the most valued symbols of their cultural heritage. Kosovo is considered the cradle of the Serbian nation and of the Orthodox Christianity Serbs embrace. Many of these sites are also on UNESCO’s heritage list. One of the few things that all in Kosovo agree on is the immeasurable value of the ancient buildings, often adorned with medieval frescoes and icons. But the question of their ownership goes right to the heart of the intangible political problem that is Kosovo, dominated by predominantly Muslim Albanian Kosovars with painful memories of Serb rule. Some take a purely conservational stance. “We need to convince the Serbs they are part of Kosovo’s heritage, and convince Albanian Kosovars that part of Kosovo’s heritage is Serbian,” says Nol Binakaj of Cultural Heritage without Borders, a non-governmental organization promoting interest in heritage without prejudice to ethnicity. He dreams of a day when tourists will pour in to visit the monasteries, now still heavily guarded for fear of attacks by Albanian Kosovars. In the presently tense atmosphere, mass tourism is unlikely. Both the church and the Serbian state jealously guard the monasteries. The government in Belgrade will have nothing to do with the Kosovar state it does not recognize, and continues to fund and regulate the convents it considers on its own territory. Pack a bit of optimism, should you ever wish to visit some of the most amazing structures in the region.